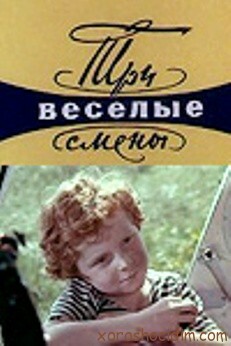 A family three-part comedy Tri vesyolye smeny (Three Funny Sessions) is about a funny adventures of the children in a summer camp during summer vacation. Directors: Dmitri Mikhleyev, Yuri Oksachenko, Valery Pozdnyakov. Cast: Zhora Belov, Yuriy Demich, Waléra Kanischtscheff, Olga Lysenko, Viktor Mamaev, Arkadi Markin, Yuri Medvedev, Gennadiy Ovsyannikov, Vladimir Stankevich, Oleg Tsarkov, Aleksandr Zimin. Download Tri vesyolye smeny. 3 series.